The 27th edition of the Taipei International Book Exhibition is set to kick off Feb 12, 2019 at Halls 1 and 3 in the Taipei World Trade Center (TWTC). 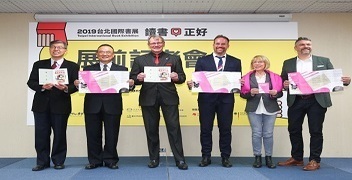 Organized by the Taipei Book Fair Foundation under the auspices of Taiwan’s Ministry of Culture, the six-day event is themed “Time for Reading” this year and features Germany as the theme country. A total of 735 publishers from 52 countries are participating, adding to the 10 innovations, 10 theme pavilions, and over 500 activities planned for the book fair. The theme country pavilion is organized by the Frankfurt Book Fair in conjunction with Goethe-Institut Taipei. Centered around the theme of “German Stories” while celebrating the centennial of the Bauhaus school, the pavilion is designed in the Bauhaus way and will feature an eye-catching Bauhaus Theater section, where the eventgoers can get a taste of theater fashion by trying out its costumes. A total of 13 bestselling German writers will grace the event with their presence this year, including Ferdinand von Schirach, psychological thriller master Sebastian Fitzek, 2018 German Book Prize-shortlisted Stephan Thome, humor writer Alexander von Schönburg, Miriam Meckel, beloved children’s book author Alex Scheffler, and creative graphic novelist Arne Jysch. Coinciding with the first week of the new semester this year, the 2019 TIBE launches a special initiative—Spring Semester Starts at TIBE—inviting student groups from all primary and secondary schools in Taiwan to join the fun of reading. Exciting activities and reading forums which are tailor-made for young students will spice up the book fair. Co-organized by the MOC and Academia Sinica, “Roaming in Fantasy: Creative Comic Collection Exhibition” transforms local comics into a three-dimensional experience. Via virtual reality, the exhibition enables visitors to experience Taiwan’s signature motorcycle traffic scene, as well as virtual 3D bookshelves and the rebirth of long-lost historic buildings. The Children’s Book Pavilion presents “Taiwan/Bologna 30” this year. Curated by famed illustrator Page Tsou, this special exhibition comprises “30Years of Taiwan Illustrators in Bologna,” “1989-2018 Taiwan Illustrators Selected by Bologna Illustrators Exhibition” (featuring 60 original works by award-winning artists), “READING AND LEARNING: A selection of the best non-fiction books from the past decade of the BolognaRagazzi Award,” and “Illustrators Salon.” Many artists are scheduled to give talks in the salon. “READING AND LEARNING: A selection of the best non-fiction books from the past decade of the BolognaRagazzi Award” consists of 100 picture books from the Ragazzi Award’s knowledge-based category, hand-picked by event advisor Grazia Gotti. This special exhibition is making their global debut at the 2019 TIBE. Jinyong (1924-2018) was the most iconic martial arts novelist in the global Sinophone community. With 15 beloved novels, Jinyong left a lasting influence on Mandarin Chinese literature by combining culture, history, and fiction. In commemoration of the master novelist who passed away last year, the 2019 TIBE presents the Jinyong Teahouse—an eclectic collection that will showcase the master’s calligraphy, and manuscripts, and works inspired by his novels; including comics, TV dramas, movies, as well as different editions of his novels. Adding to the fun of the exhibition are 40 illustrations from the original editions, giving Jinyong fans a chance to delve into the depths of his fascinating stories. Five rest areas will be set up at in TWTC Hall 1 and Hall 3. TIBE visitors will be able to take a rest or simply enjoy quality reading time in the rest areas. Starting December 2018, a public reading initiative has been spreading all over Taipei, New Taipei, and Keelung cities, with over 226 mobile gallery and library activities held to boost public participation. With the official launch of the new TIBE mobile app, eventgoers can search for participating publishers, live activities, and best deals on their mobile devices. They can even vote for the best booth design via the app. During the period of February 12-17, any Taiwan Railways or Taiwan High Speed Rail paper tickets can be presented for free TIBE admission. A free coffee is available with purchases of over NT$888 (US$29). The first 150 ticket buyers of the day will receive a complimentary breakfast voucher.